Need more information about booking Home 9218096 ? Leave your children play safely in their private indoor playground while you prepare your BBQ or enjoying the pool or even if you just look for some time for yourself . Getting around the area can be done with several ways and not only by car. You can explore small villages around , gorges and other nature seeings even on foot or bicycle. Elefterna Museum is only 6,5 kilometers far . Only one rule. Bring with you a tea or coffee cup ( mug )from your country or city or even with your name like previous guests did, to show your presence there and consider that like a gift for us for the good services you are going to have. We want our collection to grown with more cups from more places all over this planet. You can get in touch with Dionissis (the owner) through the contact form on this page. Send Dionissis (the owner) an email through the contact form on this page. Alternatively, if there’s a phone number on this page, you can call them. How do I contact Dionissis (the owner)? 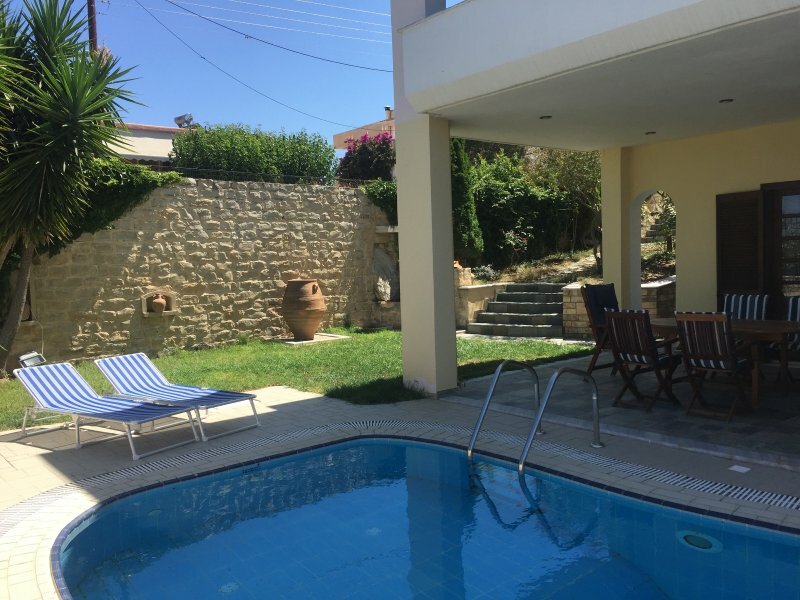 If you’ve already booked, go to Manage your holiday booking to view Dionissis the owner's contact details or send them a message. Or send Dionissis (the owner) an enquiry through the Contact the owner/manager form if you’d like a quote or more info first. When you pay online through the Book your stay form, a booking request is sent to Dionissis (the owner). You’ll find out within 24 hours whether they’ve accepted - no money will leave your account before then. You can also request a quote from Dionissis (the owner) through the contact form. The owner will email you the total cost for your dates and a link to book and pay online. Use the Book your stay form to pay provisionally online. You can pay by credit/debit card or PayPal. Dionissis (the owner) will have 24 hours to accept the booking and no money will leave your account before then. Why can't I call Dionissis (the owner) before booking? You’ll need to contact Dionissis (the owner) to do this. Send them a message in Manage your holiday booking or through the contact form on this page. You can request to change the dates or number of people on your booking via the Manage your holiday booking page. To change your holiday dates use the Edit booking button. If you need to change the number of guests staying then send Dionissis (the owner) a message. If Dionissis (the owner) agrees, they’ll send you a revised quote outlining the changes. You can review and accept/decline this from the Manage your holiday booking page. You’ll have 48 hours to take action before the revised quote expires.